At least twenty Swallows and I counted sixteen Wheatears around Slonk Hill Farm, north Shoreham, and the bridlepath to Mossy Bottom produced a similar number of Wheatears at Stonechat Junction, where there was at least one pair of Stonechats. Perched on top of a berried Hawthorn, the white breast and grey wings of a Lesser Whitethroat stood out clearly, and this was the longest view I have had of this bird, albeit at distance where its markings could only just be discerned through binoculars. Butterflies were even scanter than usual with a dozen or so Small Whites and one Small Heath on the route to New Erringham. Just past New Erringham Farm to the north, a hundred Starlings flew out of a small Bramble Hedge; at first fifty flew out, followed by another twenty and then three groups of ten birds each. The first fall (emigrating birds) of 18 Wheatears were seen in a small area surrounding New Erringham Farm (north of Shoreham on the downs). 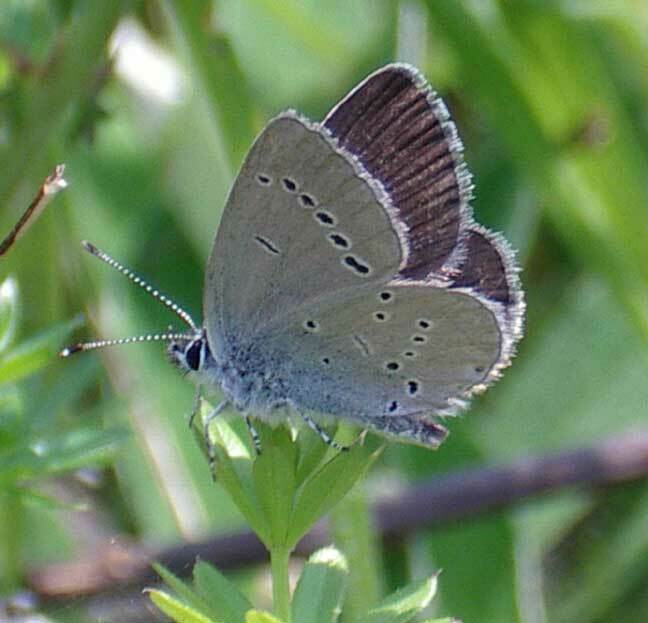 A couple of Chalkhill Blues were seen on Southwick Hill. 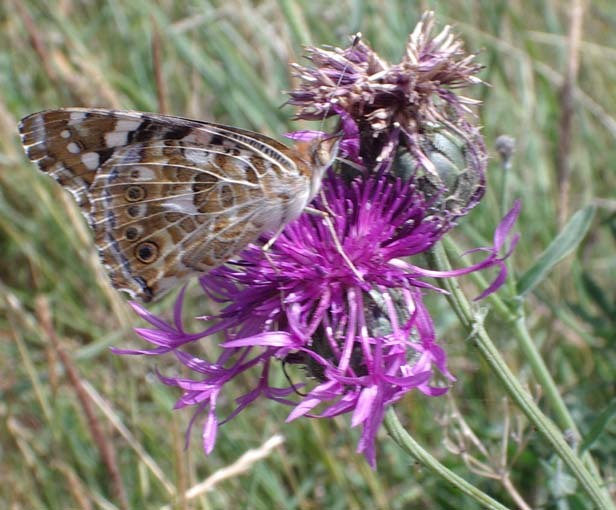 Records of this butterfly on the hill are exiguous. The chalk bank of Slonk Hill has only been in existence since 1971 when the road was built and it is a pity that it is a far from tranquil spot because the variety of wild chalk plants would please a botanist, albeit even of some of them are from continental seeds. 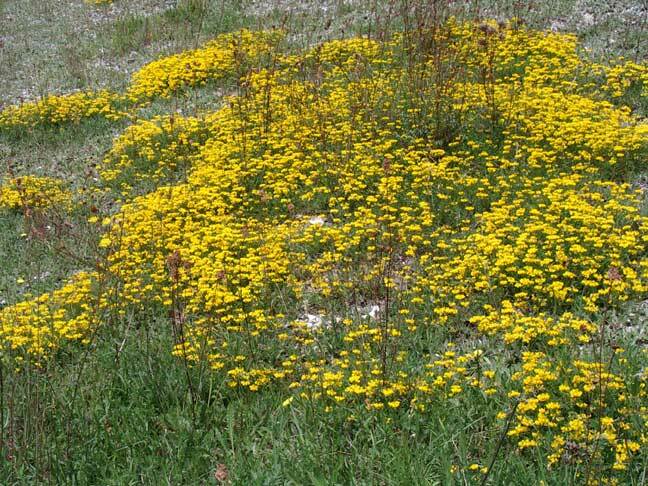 It is ungrazed and will never be because even humans would disturb the fragile bank. A Grizzled Skipper settled and this was a useful size comparison being slightly larger than the Small Blue Butterflies. The first Adonis Blue Butterfly of the year was also seen nectaring on a Hawkweed. 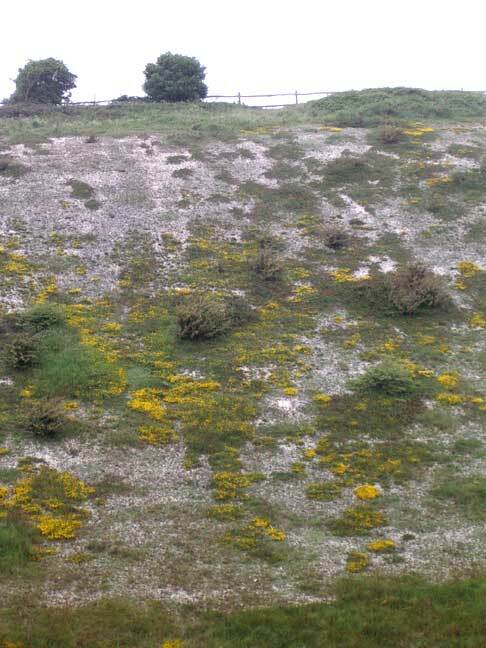 1) the lack of long green stems and leaves running prostrate over the ground means that although the flowers may be impressive it does not dominate the flora in quite the same way as the prostrate forms and there are not nearly as many leaves and consequently this form does not support as many Chalkhill Blue Butterflies, if any at all. 2) this may a chromonsonal/genetic difference; it could be diploid instead of tetrapoid but needs an expert to distinguish the two. 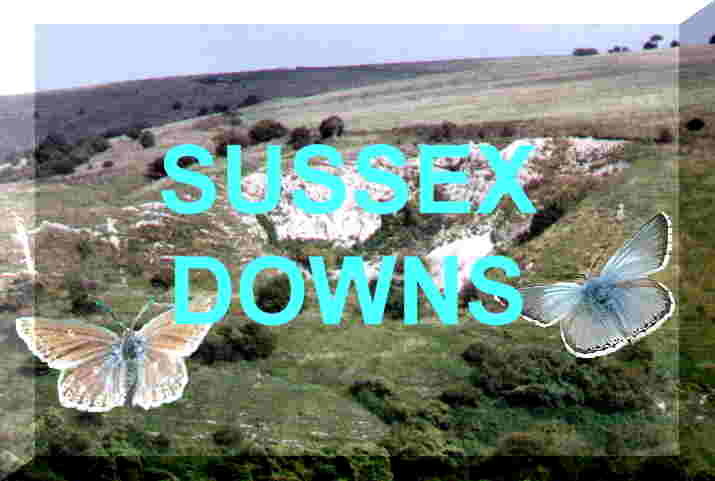 There were a handful of small dark blue butterflies fluttering over the Horseshoe Vetch and Common Vetch on the steep chalk south-facing bank in the humid sunshine as the traffic roared past. These butterflies were Small Blue Butterflies, which is the first record on these Nature Notes pages. I counted half a dozen, but I would estimate that there were at least a dozen in flight in the hot sunshine around midday, but they were not be be seen when I returned in the evening. These butterflies were smaller than a Grizzled Skipper. Some of the yellow flowering was because of Sow Thistle and there was an Ivy covering on the top of the cliff. The Slonk Hill banks on both side of road are rich in wild flowers and although not abundant in butterflies, can show a variety. Scores of Swallows rested on the barbed wire and swooped to and fro on the bridlepath just north of Slonk Hill Farm, immediately north of the pen with three black-faced heavily fleeced hill sheep with curved horns. I do not know the breed and this is always difficult of they have been crossed with other breeds. 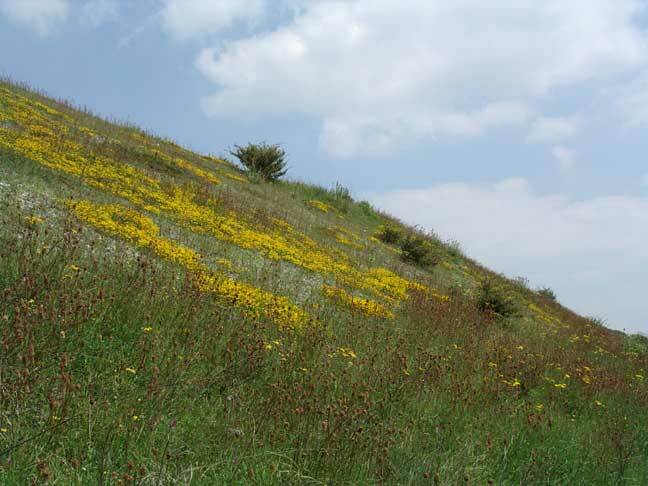 The north (south-facing part of Slonk Hill)) side of the A27 by-pass is covered in yellow Horseshoe Vetch. This steep bank is difficult to access. 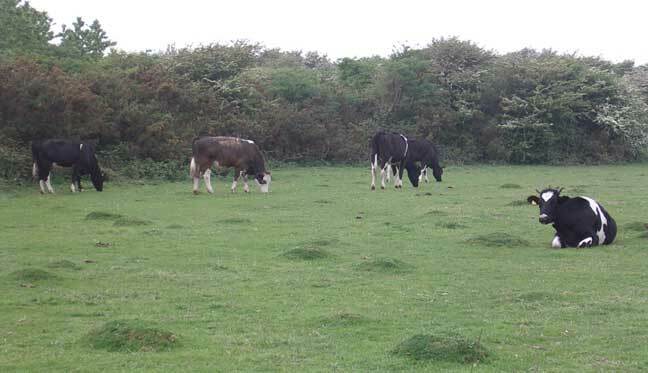 Southwick Hill lacked any sort of interest, with the cows grazing almost every wild flower out of sight, with a one probable* Speckled Wood Butterfly in Holmbush Close, but that was before the climb up the hill. (* It could have been a Wall Brown, which would have been the first of the year.) 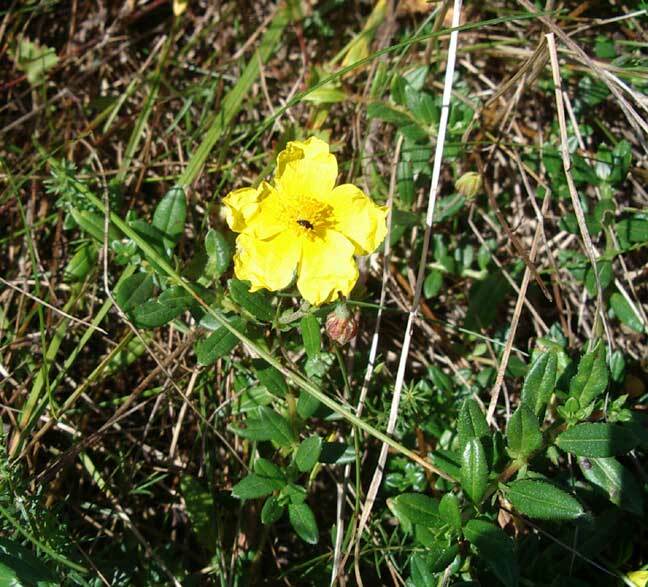 The small patch of Horseshoe Vetch spotted last year seems to have disappeared. Minutes before sunset about 8:00 pm, in a most extraordinary display of over a thousand birds that flew over the downs above Highdown, Southwick, in a large black flock that swirled in an undulating chain over half a mile long. It took two or three minutes for the birds to fly over in groups of about ten, each followed by a small gap at a height of about 25 metres (very rough estimate). These birds were larger than Starlings (although it was hard to judge their size) and without the white colour of seagulls. The birds flew out to sea and disappeared. Although they did not fly like Starlings, the idea of the huge flock feeding on the downs and then flying back to their roost on the West Pier, Brighton, seems the most likely explanation. A Common Buzzard was identified flying over the eastern ridge (Thundersbarrow) as viewed from Mill Hill, with 140 Lapwings flying around as well as a flock of 33 Fieldfares, and these thrushes were about fifty in total. A Peregrine Falcon was seen near Truleigh Hill. A probable Rough-legged Buzzard was hanging and occasionally hovering over a ridge between New Erringham Farm and Thundersbarrow Hill, north of Shoreham in the evening from 5.15 to 6.03 pm (when virtually dark), viewed through a scope from the minor road north of Mill Hill at about 1 km distance. "It had an obvious white tail with a thick dark terminal band! As well as the tail pattern the bird I saw was heavy bodied and long winged (recalled a small eagle more than a buzzard) with fairly uniformly dark upperparts and very pale underparts with a somewhat darker head and belly and obvious black tips to underside of primaries and secondaries. Though I saw it for 45 minutes at reasonable range through a scope it was frustratingly mostly facing directly away into the wind and at a similar height to me. It appeared to have somewhat darker carpals and, from above, limited pale at base of primaries - suggesting it was an adult/near adult (female)? When first seen it was hovering by the road just south of New Erringham Farm but it was slowly going away by time I stopped car and got my bins on it. 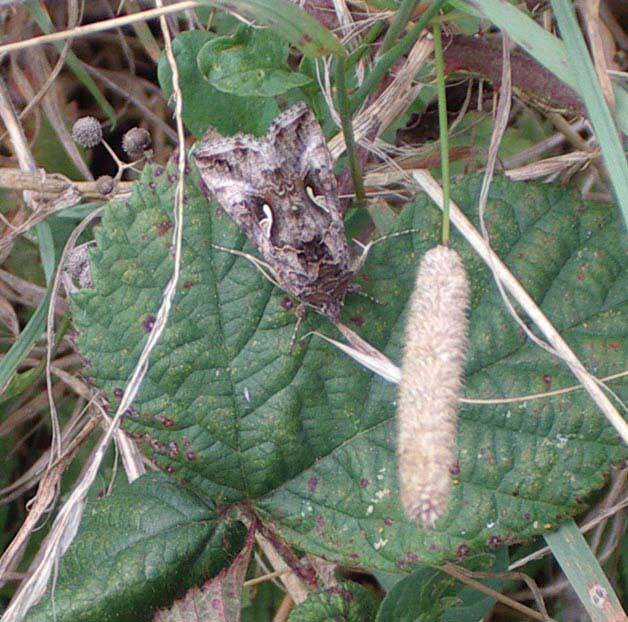 It then landed on a post just south-east of New Erringham Farm, but was over the far ridge where it then remained by time I got my scope set up." 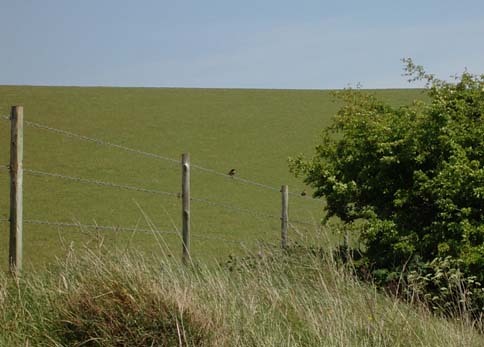 At Happy Valley (behind Slonk Hill), Shoreham, two Stonechats were recorded. New Erringham Farm produced a flock of about 25 Corn Buntings, plus a further five on the road to Truleigh Hill. All these sightings were also recorded by other observers recently. 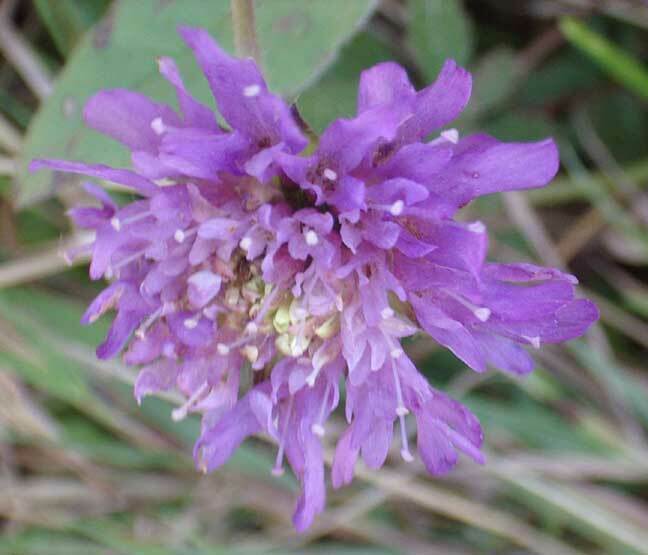 Field Scabious was still in flower on the edge of the bridlepath running north from Slonk Hill. 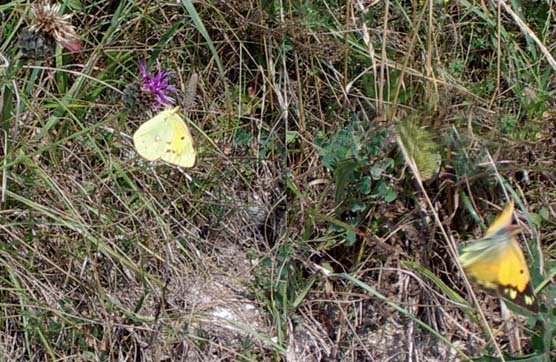 A Pheasant struggled to become airborne on the path leading to Mossy Bottom from the east, where a Clouded Yellow Butterfly fluttered amongst the grasses. Two chirms of Goldfinches numbering over 100 small birds flew around near New Erringham Farm. They preferred to hide in the Hawthorn, but not exclusively. It is a long walk to Southwick Hill and it is pity that more often than not it turns out disappointing, but this time I veered off to the west and found a patch Horseshoe Vetch (not in flower, of course) in a clearing amongst the Gorse, but there was just the one Chalkhill Blue, but this could explain the presence of Adonis Blues in August 2000, but the brightest blue today were Common Blues (25+), the commonest blues on display. They were also the commonest butterflies after the Large Whites (50+), with more than a score of Meadow Browns (including a pair mating in flight) and over a dozen Gatekeepers, with a handful each of Small Tortoiseshells, Speckled Woods (amongst the Gorse), Small Whites (one landed on my bicycle), and at least one Painted Lady, Red Admiral, Wall Brown and Clouded Yellow. 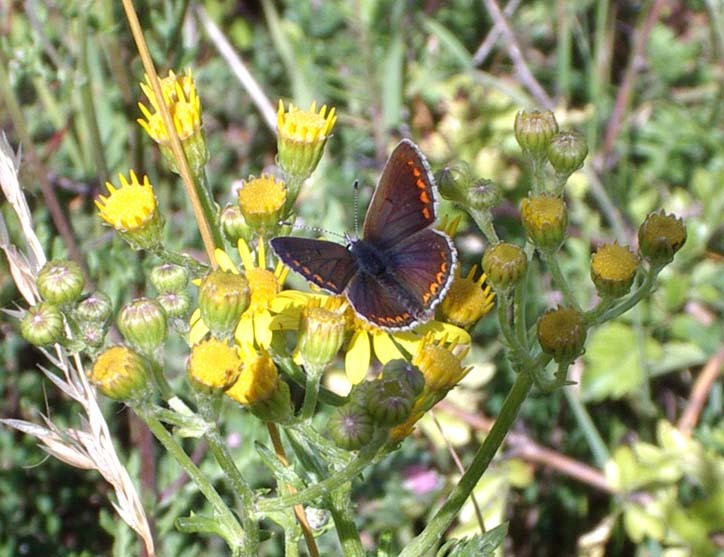 A Brown Argus Butterfly was a surprise discovery on on the Slonk Hill A27 southern embankment (TQ 228 067) with other butterflies including Meadow Browns, Gatekeepers, Red Admirals, Large Whites, one Speckled Wood, a few Chalkhill Blues, and Large Skippers. 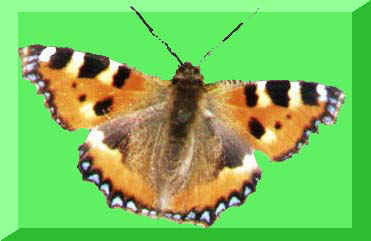 On the shallow climb from Slonk Hill Farm north of the hill towards Mossy Bottom, there were at least a dozen Painted Lady Butterflies in bright colours, a single Small Tortoiseshell Butterfly with a bit of its wing missing (in old colouration) as well as the usual Meadow Browns and Gatekeepers. The half a dozen blue flutterings in the long grasses and parched earth with Scabious by the bridlepath were Common Blue Butterflies. A Wall Brown Butterfly flew past Mossy Bottom, as simultaneously a couple of Goldfinches perched on the barbed wire. The Gorse-lined bridleway from north Southwick (Hawkins Close) to Southwick Hill and Thundersbarrow recorded just three Wall Brown Butterflies and nothing else worth mentioning, unless you count a dozen Jackdaws on the National Trust grazed grassland. So uninteresting that I retraced my steps and took the path down to Mossy Bottom. 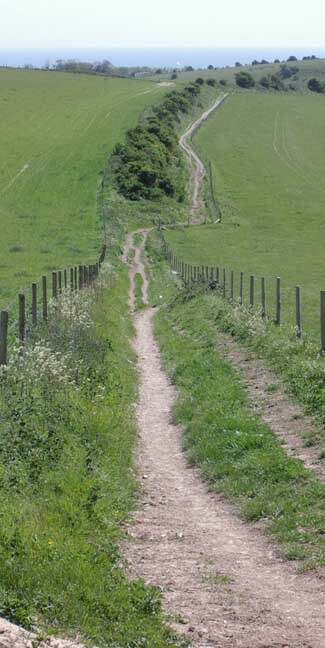 My attention was drawn to a pair of birds calling stridently from a barbed wire fence by a Hawthorn tree at the junction with the path down to Slonk Hill (TQ 225 078). The male Stonechat was particularly striking with its almost black cap, really quite a red breast and just a glimpse of white on the throat. The male frequently cocked its tail in an upright manner. The female Stonechat was a rather pale brown comparatively, perched only about two metres away on the same wire. 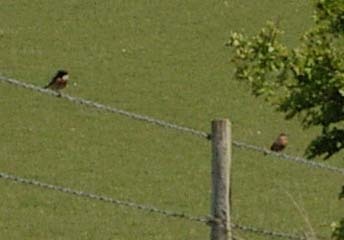 The call of Stonechats are what made me aware of its presence. In this case it may have been my presence that prompted the danger call. The Stonechats seem to perform the role of sentinel like the Redshank on estuaries. 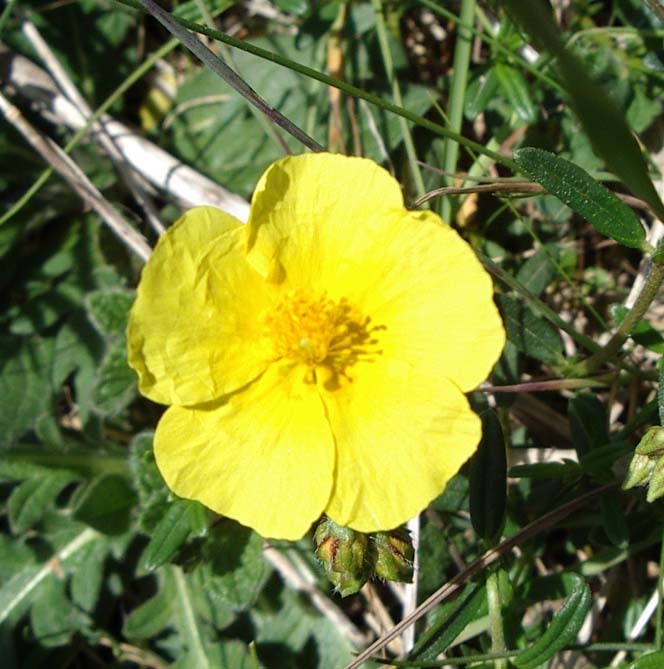 The understory of the Hawthorn contained the Rock Rose, recognised by the yellow flower and this species of plant is known to the food plant of the caterpillars of the Brown Argus Butterfly. In this location it was inconspicuous, almost lost amongst the grasses. At Mossy Bottom I do not know if it was a Sparrowhawk or a Cuckoo which flew rapidly away from me, (and I was looking down on to the upper wings of the bird), to the small copse in the south-west. It was too far away to be sure. The hovering Kestrel at New Erringham was unmistakable. From the bare field to the south-west of Southwick Hill the melody of a Skylark filled the air for ten minutes or more without a break. It would need a directional microphone to record the songs because in the distance the hum of the traffic on the A27 could be heard as well as clattering from the dockside at Shoreham Harbour. The small falcons are not always to separate at a distance, but the blunt-shaped head and swooping flight without hovering, together with the subdued colours (compared to a Kestrel) indicated a male Sparrowhawk at New Erringham Farm in the dip of the downs north of Shoreham. The shirt sleeves sunny weather was unseasonal, recorded at 21° C in the shade and this brought the butterflies out with 50+ Small Tortoiseshell Butterflies from the path north of Slonk Hill past New Erringham to Mill Hill, with 15+ Peacock Butterflies. A Red-tailed Bumblebee, Bombus lapidarius, crawled into the long grass near Mossy Bottom Barn.